Many people have the mistaken notion that, being natural, all herbs and foods are safe; this is not so. Very often, herbs and food may interact with medications you normally take, result in serious reactions. During the latter part of this century the practice of herbalism has become mainstream throughout the world. 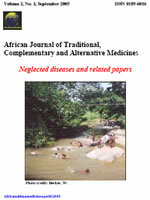 This is due remove to the recognition of the value of traditional medical systems in the world. Herbal medicines are mixtures of more than one active ingredient. The multitude of pharmacologically active compounds obviously increases the likelihood of interactions taking place. Hence, the likelihood of herb-drug interactions is theoretically higher than drug-drug interactions because synthetic drugs usually contain single chemical entity. Case reports and clinical studies have highlighted the existence of a number of clinically important interactions, although cause-and-effect relationships have not always been established. Herbs and drugs may interact either pharmacokinetically or pharmacodynamically. The predominant mechanism for this interaction is the inhibition of cytochrome P-450 3A4 in the small intestine; result in a significant reduction of drug presystemic metabolism. An additional mechanism is the inhibition of Pglycoprotein, a transporter that carries drug from the enterocyte back to the gut lumen, result in a further increase in the fraction of drug absorbed. Some herbal products (e.g. St. John’s wort) have been shown to lower the plasma concentration (and/or the pharmacological effect) of a number of conventional drugs including cyclosporine, indinavir, irinotecan, nevirapine, oral contraceptives and digoxin. The data available so far, concerning this interaction and its clinical implications are reviewed in this article. It is likely that more information regarding such interaction would crop up in the future, awareness of which is necessary for achieving optimal drug therapy.